Melamed Kosher Computers Provide a Complete Solution - At a Value Price! Melamed Kosher Chromebooks are lightweight computers that can be stored in a cart or closet, and distributed to students at their classroom desks for the online course period. No need for a designated computer room. No need to purchase designated computer desks. No need to buy software or hire an IT specialist. Melamed arranges every detail. We include maintenance in your purchase price, and it's done remotely. You'll have working computers every day! Software & Apps - Included! 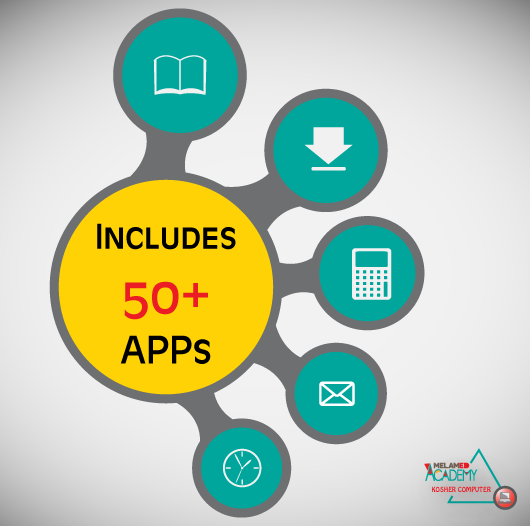 When you order Melamed Academy computers, you view our list and decide which software and apps should be included for your students. Each class can have its own settings. When the student logs in, he sees his lessons and apps. The student's settings work on any of your Melamed Chromebooks; the student doesn't need to use a particular device. Just hand them out, and start learning without any transition lag. 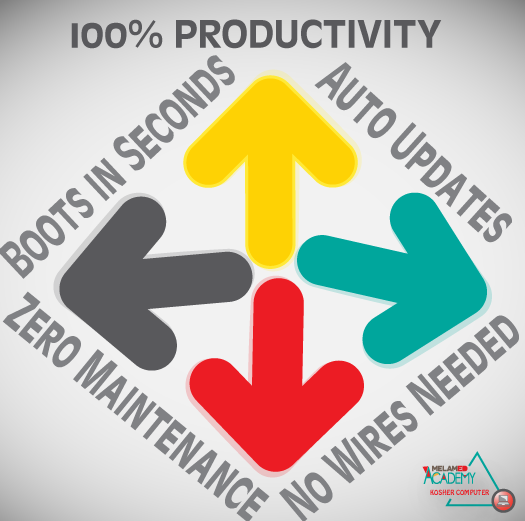 The software versions get updated automatically - there's never any downtime. Every student receives an online word processor, spreadsheet, and presentation software package. Students can save their documents in their private online drive storage, and access them from any location. Schools decide whether students should have access to their school email account. In any case, the email is only internal, and cannot receive or send to unauthorized email addresses. Just Push the ON Button and Start Learning! At Melamed Academy, we understand that school principals and parents have a busy life and can't spare a few hours to learn how to plug in their new computers. Melamed Kosher Chromebooks arrive pre-programmed according to your specifications. Students login with their Melamed ID and their lessons pop up automatically. While they're engrossed in their screens, with their headphones on, you'll have time to catch up on your paperwork. Melamed Academy courses require high speed internet and sufficient broadband to accommodate all the students on the computers simultaneously. But this doesn't need to become a heavy expense for schools because federal E-Rate covers lots of the cost. The schools and libraries universal service support program, commonly known as the E-rate program, helps schools and libraries to obtain affordable broadband. A technology plan is a plan prepared by a school or library to explain how telecommunications and information technology will be used to achieve educational goals, curriculum reforms, or library service improvements. Starting with Funding Year (FY) 2011, schools and libraries applying for Priority 2 Internal Connections and Basic Maintenance services must prepare a technology plan. Before FY2011, technology plans were required for all eligible services other than basic telephone service. (4) An evaluation process that enables the school or library to monitor progress toward the specified goals and make mid-course corrections in response to new developments and opportunities as they arise. Melamed Academy's Internet Safety mini-course teaches children about internet safety and digital etiquette. Students practice their knowledge in simulated scenarios such as: the dangers of sharing personal information, dealing with cyberbullying, respecting copyrights and digital property, and respectful communication. Melamed's course provides schools with evidence of compliance with CIPA. A Chromebooks is a lightweight laptop which works on the Google Chrome operating system. Chrome is an internet browser, and uses software that is internet-based. This means that the computer always updates its virus protection and software versions automatically, in the background, without any disruption to the user. The laptop also boots in seconds since it isn't lugging a heavy hard drive. Chromebooks connect to the internet using Wifi. 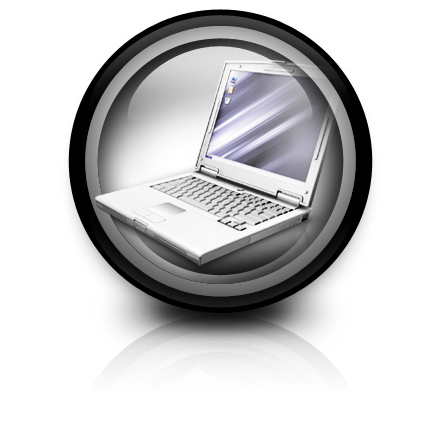 It is possible to create and edit documents without internet connectivity, but the primary use of these laptops is internet based. Where are Chromebooks Cheaper: at Melamed or at a Store? Chromebooks come in various models, with a wide price range. Melamed Academy offers the lower-priced models, to minimize the expense for our students. It's important to understand that a Melamed Kosher Chromebooks is significantly different than the same model on a store shelf. The kosher protection works via a license which Melamed Academy purchases from Google and installs on the device. This license attaches the device to Melamed Academy's cloud-based network, enabling our unique settings to take effect. Due to Melamed Academy's subsidies, our students receive these computers complete with the license and pre-programming - at the same price as the store model! 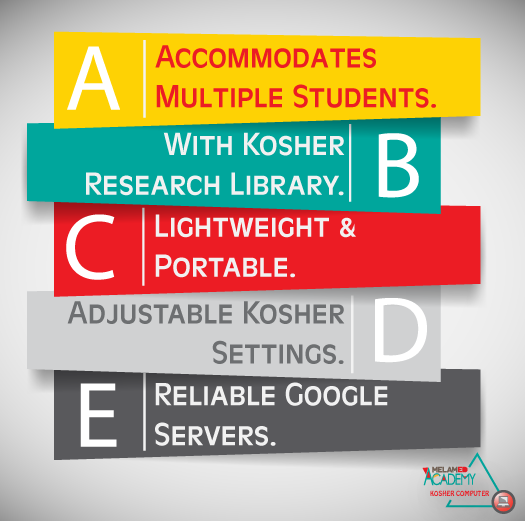 What is Included in the Melamed Kosher Chromebooks - and What Isn't Included? Melamed Kosher Chromebooks come with all the accessories: quality case, headphones, and wireless mouse. The software is also included: word processor, spreadsheet, graphic art programs, calculators, dictionary, encyclopedia and more. The only thing that you need to add is an internet service plan. Will Melamed Kosher Chromebooks Work in Any Location? Yes, any location on Planet Earth. When a Melamed Kosher Chromebooks connects to the internet, it will always automatically receive the kosher settings. This is an excellent safeguard, ensuring that even if the device travels to the airport or the coffee shop - the student is always receiving the same protected environment. Do Melamed Kosher Chromebooks Require a Designated Computer Room in a School? Since Melamed Kosher Chromebooks are compact and lightweight, they can fit on students' regular desks. It isn't necessary to buy any new furniture or find a donor to dedicate a new wing. Additionally, the laptops can be carted from room to room, and used in multiple classes every day. Students can also take them home and continue exactly where they left off. The only requirement is adequate internet reception. Order Now for Best Value!